Praying for Jeanine: An altar for Jeanine Sanchez-Harms was set up during a prayer service Aug. 26 at St. Thomas of Canterbury Church, 1522 McCoy Ave., on the outskirts of Campbell. The service was held almost a month after her disappearance. Almost a month to the day after her disappearance, Jeanine Sanchez Harms' friends and family held a prayer service at St. Thomas of Canterbury Church, 1522 McCoy Ave., on the outskirts of Campbell. Those in attendance wore purple ribbons and prayed that God would help them find their friend. 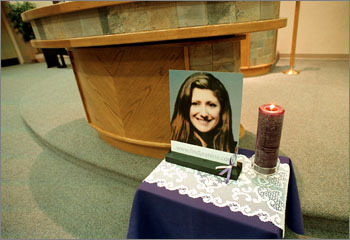 Harms' photo sat on an altar at the front of the church next to a purple candle. Some cried and some sang hymns, but everyone hoped for a miracle. A Los Gatos resident, Harms was born Jeanine Sanchez in San Jose and grew up in Campbell, graduating from Prospect High School and San Jose State University with a degree in liberal arts. Since Harms' disappearance, her family and friends have been out en force, passing out fliers, holding get-togethers at restaurants to get media attention for the case and even buying space on two giant billboards, with enormous photos alongside a description of where Harms was on the night of her disappearance. On July 27, Harms, 42, had dinner with Janice Burnham, her close friend of 27 years, and another friend at Bucca di Beppo's in the Pruneyard. Harms told them she had a date at 7 p.m. at the Rock Bottom Brewery, also in the Pruneyard, with a man she'd met the week prior. That man, later identified by police as William Alex Wilson III of Santa Clara, is not considered a suspect in the case. Harms indicated to Burnham that she planned to stop by another bar in Campbell later. Police reports indicate that Harms and Wilson went to Court's Lounge in a group and returned to Rock Bottom, where Harms left with another man, 42-year-old Maurice Xavier Nasmeh, who has been interviewed by police. The two stopped at Jiffy Mart in Los Gatos and then went to Harms' house at around 10 p.m. Nasmeh told police he left at 1 a.m., after Harms fell asleep on her couch. Early on in the investigation, police were not releasing Nasmeh's name but said they recently decided to post his name and picture on fliers around the county because he has stopped cooperating with officers and hired an attorney. Nasmeh, a San Jose architect, alleged that police became aggressive in dealing with him, at which time he hired a lawyer, who advised him not to talk to investigators. Both Nasmeh's and Wilson's homes and cars have been searched, and DNA samples have been obtained from each. After the evening of July 27, Burnham said she tried to call Harms several times during the weekend and left several messages on an answering machine. She also tried calling Harms' cell phone, which was turned off. When Burnham called Amdahl in Sunnyvale, where Harms worked as a purchasing manager, she was told Harms had not shown up for work. Burnham, Harms' parents, her brother Wayne and a friend who owns Harms' duplex went over that Monday morning and found that Harms was not there, although her car was. They then called the police. Los Gatos-Monte Sereno police found that some of the items in the house had been moved or removed in a manner that could be consistent with foul play, although they are not releasing detailed information about those items. In a radio broadcast on KKUP 91.5, Harms' friends, Burnham and Chigiy Binell, said they saw the home, and Binell said it was "chillingly orderly," but couldn't comment on the items that were missing other than to say they were not items of value. The two friends said police used Luminall in the home, a chemical that detects blood not visible to the naked eye, but said they were not at liberty to reveal the results of that test. "We just hope that somebody will come forward with something," Burnham said. Added Binell, "Whoever did this is still out there. He's probably wearing a suit, maybe he's getting ready for lunch right now. He could do this to your sister, your mother, your daughter." Since Harms' disappearance, police have put out a missing person teletype all over the county and state and made use of K-9 units and the county crime lab. The TV show America's Most Wanted showed a clip of the disappearance and Amdahl donated a sizable chunk of money to the $10,000 reward for Harms' safe return. Harms' friends say they're planning on putting up bus shelter billboards as well. Josh Golden, Harms' cousin, set up a website, http://www.findjeanine.com/. Harms was in the midst of divorce proceedings with Randy Harms, whom she married six years ago. Friends have described the separation as an "amicable divorce," and the two have been apart for more than a year, with a court appearance scheduled for some time in August. For more information about this case, visit http://www.findjeanine.com/. To donate money to the Friends of Jeanine fund, either call Bank of the West at 408.354.6161 or send donations to The Jeanine Sanchez Harms Fund, c/o Bank of the West, 308 N. Santa Cruz Ave., Los Gatos, 95030. The Los Gatos Police Department can be reached at 408.354.8600. Anonymous tips can be left for the police as well. The number for that line is available on the website. Planning Commission approves a retail-office complex on Campbell Ave.
Moryt Milo: Bye-bye blackbirds, what's next? Copyright © SVCN, Inc. Maintained by Boulevards New Media.